Available in 4ml, 10ml and 30ml sizes. The 4ml vials come with a lined cap and an orifice reducer. 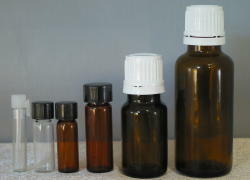 The 10ml & 30ml bottles are also known as Eurodropper style bottles. Include an orifice reducer to allow 'drops' to be poured one at a time. They come with a tamper evident caps.